Short of the actual clothes I'm wearing, I pretty much did wake up like this. It's one of those "how did the time go by so fast?" kind of mornings and then you wish you spent the 5-10 minutes in bed looking at IG more wisely. i sometimes do that too. go through my phone in the morning and then realize that what felt like 2 minutes was actually 15! Love those pants! I wanted to get them but they just didn't look good on me. Love how you styled them! Well you did a great job! Love those pants! Hello darling!! really cool look!! It's really trendy!! Today I'm showing on my blog the first t-shirt form my new collection!! take a look there!! I absolutely adore this look! So sporty and cool! I know that feeling when you wake up but stay in bed and then the time passes by so fast and suddenly you have to go, lol! Such a fun look! Thanks for stopping by EPWL! Oh that we all might be so lucky to wake up looking this good! Those pants are fab! I wish I looked as good when I woke up! OMG those pants are so fabulous!! Love them paired with the leather! So gorg! I wish I could look 1/2 as good waking up. I get up every morning at 6 and somehow, I can barely leave the house by 8:30 for the office. I always wonder why it takes me that long to get ready and pack lunches for lunch. Wait...I know...too much IG and blogging too. Pretty!! I'm soo in love with this look.. especially the trouser! Haha, you just wake up naturally cool and fabulous! Love the trousers! This outfit looks awesome, I love it! Such a fun look! 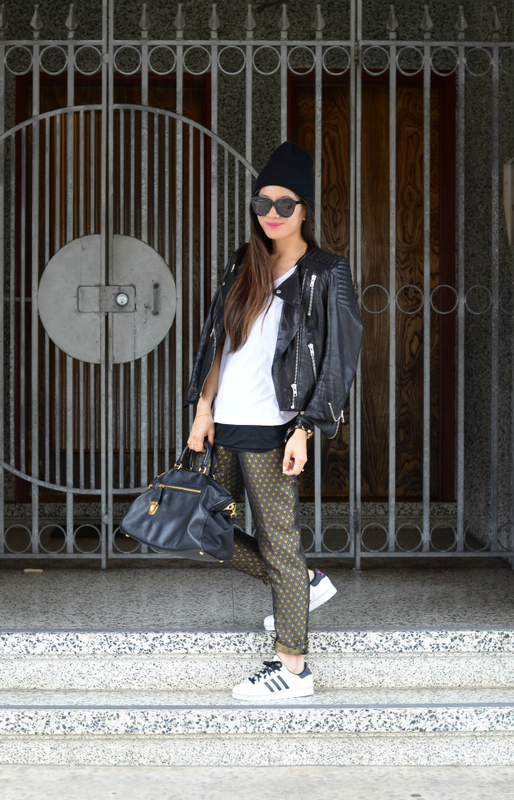 Love those pants and this entire look! Looks like you woke up flawlessly haha. 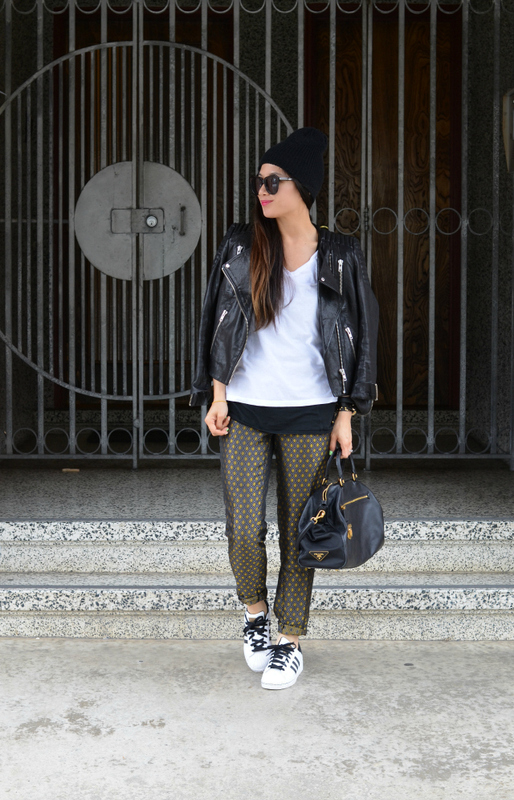 Love this laid back look, those pants are amazing! We can't remember the last time we saw adidas look this good. Totally rocking this outfit and we want everything. i love those pants! so fab!! I feel like this every morning. Even when I do wake up on time or a little early, I'm doddle about and then I'm invariably running late! Cool pants, Nancy, very cool pants. Such a chic look! Love these pants! Love this look, casual but super edgy. What fun pants! Love that you paired a leather jacket with them! Love your jacket and pants! You make 'cool' look so effortless. Always. I think the beanie and jean jacket combination is perfect. Even if you only spent 5-10 minutes throwing it all together! If you woke up like this, then I'm definitely doing something wrong! 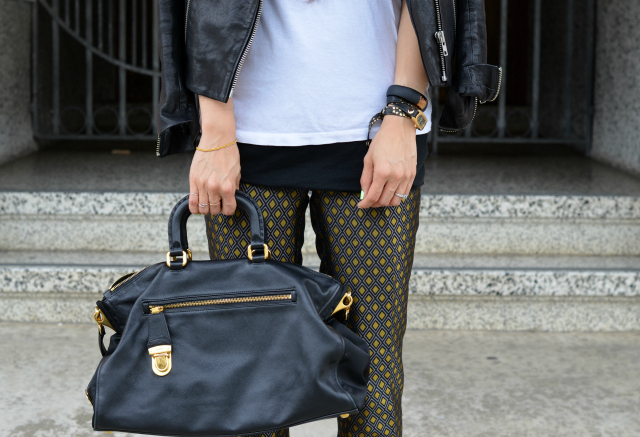 Love this edgy outfit! GAngstaaaaaaaaaaaaa! I like it. It makes me wanna sip Gin and juice.